France captain Zinedine Zidane was sent off in Sunday's World Cup final defeat for headbutting defender Marco Materazzi in the chest. The midfield star, who has now retired from football, appeared on French television on Wednesday to explain his actions. Here is a translation of what he told the TV channel Canal Plus about the Materazzi incident. Interviewer: You know the Italian players well because you played in Italy for five years. Did you have any problem with any of them beforehand? Zinedine Zidane: Not at all. You always have friction with certain players...that is the game, it has always been like that. But I never had any clashes with anyone. Zinedine Zidane: No, never. There was nothing beforehand and nothing in the match until he started pulling my jersey. He grabbed my shirt and I told him to stop. I told him if he wanted I'd swap it with him at the end of the match. That is when he said some very hard words, which were harder than gestures. He repeated them several times. It all happened very quickly and he spoke about things which hurt me deep down. 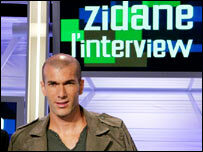 Zinedine Zidane: They were very serious things, very personal things. Interviewer: About your mother and your sister? Zinedine Zidane: Yes. They were very hard words. You hear them once and you try to move away. But then you hear them twice, and then a third time... I am a man and some words are harder to hear than actions. I would rather have taken a blow to the face than hear that. Interviewer: He said these things about your mother and sister two or three times? Zinedine Zidane: Yes. I reacted and of course it is not a gesture you should do. I must say that strongly. It was seen by two or three billion people watching on television and millions and millions of children. It was an inexcusable gesture and to them, and the people in education whose job it is to show children what they should and shouldn't do, I want to apologise. Interviewer: You apologise to them but do you really regret having done it? Zinedine Zidane: I can't regret it because if I do it would be like admitting that he was right to say all that. And above all, it was not right. We always talk about the reaction, and inevitably it must be punished. But if there is no provocation, there is no reaction. First of all you have to say there is provocation, and the guilty one is the one who does the provoking. The response is to always punish the reaction, but if I react, something has happened. Do you imagine that in a World Cup final like that, with just 10 minutes to go to the end of my career, I am going to do something like that because it gives me pleasure? Zinedine Zidane: There was provocation, and it was very serious, that is all. My action was inexcusable but you have to punish the real culprit, and the real culprit is the one who provoked it. Voila. How will Zidane be remembered?